Please download the latest release (Version 2) at our registration/download page. The previous releases (Version 1) can be downloaded via the same page. The ChangeLog of Version 2 can be found here. The detailed mesh creation notes and script can be found in the Release Note. A full paper regarding the mesh generation process is in preparation. Colin27 adult brain atlas (Collins1998) FEM mesh Version 2 was created by Qianqian Fang using iso2mesh (Fang2009a) version 1.0.0pre. The gray/white matter surfaces were created by Katherine Perdue with FreeSurfer V5. Please refer to (Fang2010) for details. The mesh data were saved in matlab/octave .mat format. Please load the .mat file in matlab/octave and export to your FEM simulator. 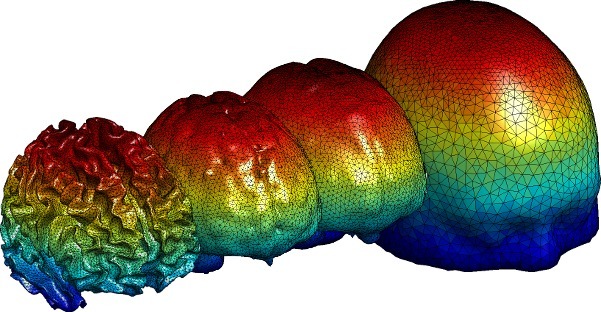 Two meshes are provided for the brain atlas: a low-resolution mesh and a high-resolution mesh. The low-resolution mesh, (2L), has 70226 nodes, 423375 tetrahedral elements and 119554 triangular surface elements (6916 for scalp surface, 12780 for CSF surface including ventricles, 61026 for pial (gray-matter) surface and 38832 for white-matter surface). The high-resolution mesh will be announced soon. The optical properties of the brain atlas was described in (Fang2010) Table 2 (the same properties were first used in (Fang2009b)). The properties for scalp/skull and cerebro-spinal fluid (CSF) are based on (Custo2006) and those for gray and white matters are based on (Yaroslavsky2002) at 630 nm. The mesh data is in the public domain. If you use this mesh in your publication, please cite the mesh version number to avoid conflict to any further updates of this mesh. Please also cite (Fang2010) for the origin of the mesh. [Collins1998] D. L. Collins, A. P. Zijdenbos, V. Kollokian, J. G. Sled, N. J. Kabani, C. J. Holmes, and A. C. Evans, “Design and construction of a realistic digital brain phantom,” IEEE Trans. Med. Imaging 17(3), 463–468 (1998). [Fang2009a] Q. Fang and D. Boas, “Tetrahedral mesh generation from volumetric binary and gray-scale images,” Proceedings of IEEE International Symposium on Biomedical Imaging 2009, 1142–1145 (2009). [Fang2009b] Q. Fang and D. A. Boas, “Monte Carlo simulation of photon migration in 3D turbid media accelerated by graphics processing units,” Opt. Express 17(22), 20178–20190 (2009). [Custo2006] A. Custo, W. M. Wells 3rd, A. H. Barnett, E. M. Hillman, and D. A. Boas, “Effective scattering coefficient of the cerebral spinal fluid in adult head models for diffuse optical imaging,” Appl. Opt. 45(19), 4747–4755 (2006). [Yaroslavsky2002] A. N. Yaroslavsky, P. C. Schulze, I. V. Yaroslavsky, R. Schober, F. Ulrich, and H.-J. Schwarzmaier, “Optical properties of selected native and coagulated human brain tissues in vitro in the visible and near infrared spectral range,” Phys. Med. Biol. 47(12), 2059–2073 (2002).